This is an unusual pair of silver-mounted glass mugs, each engraved with a continental coat of arms. The silver mounts are fully marked for 1854 by John Figg a distinguished London silversmith, but not a prolific one. On picking these mugs up, the quality immediately becomes apparent, their being quite considerably heavier than one would expect. When I first saw these, I thought they may have been used for 'black velvet' a mix of champagne and Guinness which became popular following the death of Prince Albert, but this cannot be correct as he died in 1861 and these were hallmarked in London in 1854. In the early 1960s, as we had our family Christmas break in my uncle's hotel on the edge of Dartmoor. I have fond memories of my father and uncle drinking champagne from half-pint tankards; they would slip away from the party and might be seen in a quiet room indulging themselves in private! These tankards would be excellent for just such a treat. 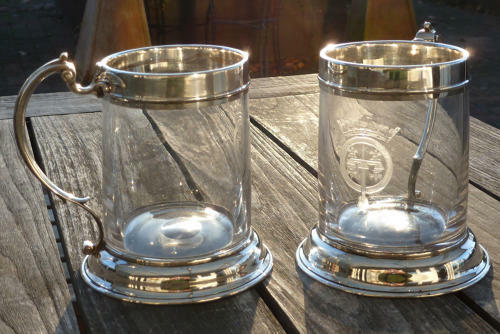 These tankards are 5", 12.6 cm. tall and hold more than a half-pint but less than a half litre. They hold about 400 ml. - just right for a can of beer - or a really serious helping of Champagne!